The challenge over at Kraftin Kimmie Stamps is "animals!" I'm a total animal lover so this is a perfect challenge for me! Here's my Krafty Kreation! I used papers from BoBunny and a few from my scrap bin. The buttons and flowers are recollections and the embossing powder is "melon" from Zig. A perfect card. I love that you stamped in Pink and left it uncolored, beautiful!! Thanks for joining our challenge this week with Kraftin Kimmie stamps. Oh girl, this is super duper cute!! 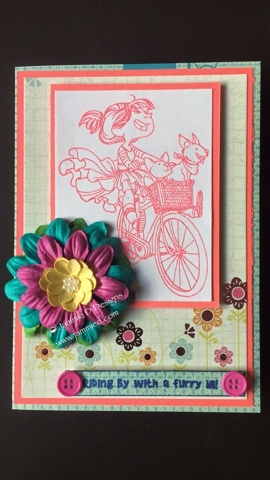 Thanks for playing along with my challenge at Kraftin' Kimmie Stamps!! HUGS!!!! !